Robin’s Nest is Resting and some May 2017 Goals! Today is day 5 of May 2017!!! Can you believe it? It seems like the months fly by after May and June and before we know it – it’s Christmas! I hope this month goes by slower. Today is a great day – feeling like my old self! Did my stretches, walked, vacuumed the house, and made it out to the Studio by 10:45 to work on 2 post that were not finished Monday. I have left Robin’s Nest for a few days (how about 5 days) to work on some applique and Brinton Hall. I am still wanting to work on some embroidery and knitting (someday). Now that I have RN started and know there may be pitfalls, I have had a nice break from it and will start sewing the 2nd ring tomorrow for sure. I am working on a quilt called Nesting for the SA Show in September – BUT if I cannot get it completed it will be next year’s quilt to show. I have completed Block 1 and started on Block 2 – there are only 4 large blocks and a beautiful border. Here is Block 1. It is an easy quilt to applique so I should be able to finish this by July. When I appliqué, embroidery or sew my bindings and sleeves, I take small stitches – like 1/8″. Here is a picture of the back of this block. And of course I am a traditional needle-turn appliquér – no glue or starch. I cut about a 5/8″ of bias strips for the vines and sew one side down, trim and sew the other side – these are less than 1/4″ stems. I always trace the pattern on my background fabric with a pencil (lightly) so it makes it easy to follow a line when doing stems. I finished the top and bottom hexagons on Briton Hall this afternoon (finally!). Next week I want to start working on the 4 left and right hexagon sections (probably more slowly). This hand work is definitely hard on the ole’ hands so I will take a day when I want to just sit and sew a section at a time. 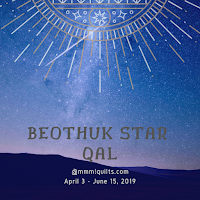 Maybe by the end of May I will be ready to start making the rest of the quilt – which MIGHT be easier! I love Batiks the colors really pop don’t they? Each section will have to be laid out very carefully and sewn together even more carefully. I made a few mistakes and had to rip a couple of times and I do not like that because of the small stitches that I do. 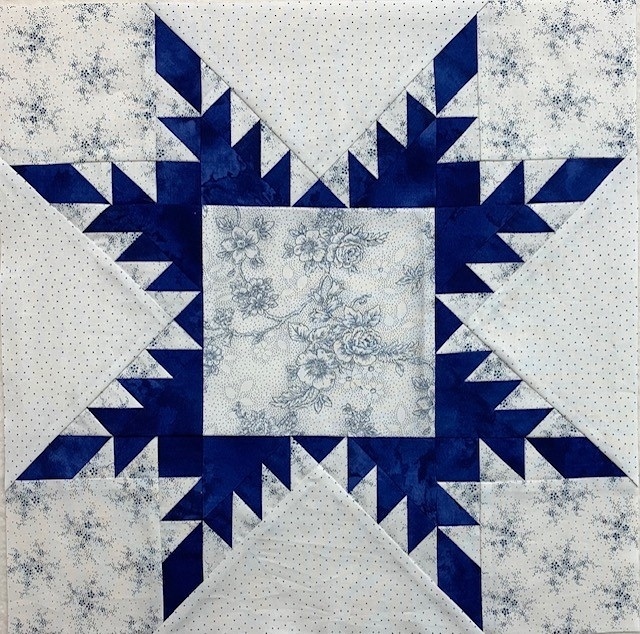 I am going to load a quilt that I made in the 2003-2004 timeframe first thing in the morning! It was one of the first appliqué quilts I made. I used all different Christmas fabrics in it and thought it looked horrible. I was looking at some of the hearts and I had fussy cut some Santa’s for the hearts! Heck I did a scrappy quilt without even knowing what I was doing! Too funny. Goals for May are to get the Christmas quilt finished, work on Nesting, Robin’s Nest and Brinton Hall. Only 26 days left! Have a great week-end! 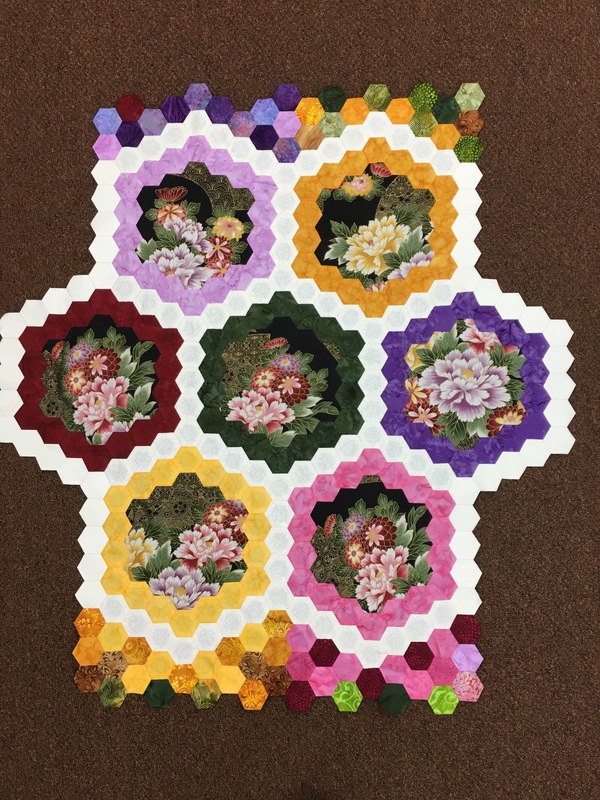 This entry was posted in Quilting and tagged Brinton Hall, Charleston by Jo Morton, Di Ford Primarily Quilts 2, Mary Koval Palamoro, Nancy Gere Ophelia fabric, Nesting. Bookmark the permalink. All these projects should be your motivation to stay in your special diet so you feel well enough to work on them. Enjoy yourself. You are so right! The last three days have taught me a big big lesson. Thank you for the encouragement! Thx for commenting and enjoying your posts! Love the block with the red birds. 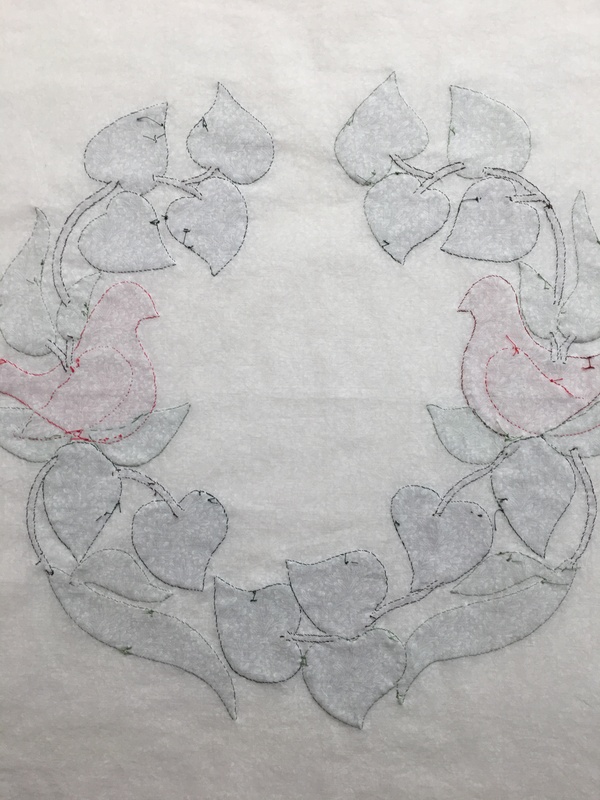 I am drawn to applique blocks with birds. I love Nesting. It is a nice change from A Bountiful Life. Those are so intense! Thx for the comments. Thank you so much. Yes I am a member, but live in La Vernia, Texas now. I did live in Sterliing VA from 93-96 but was working and never had time to quilt or really do much of anything but work! Thx for commenting. Love the Nesting block! You applique the same way that I do…needleturn. I am looking forward to seeing the rest of this project! I like Nesting also, it is a relaxing quilt to applique. Robin’s Nest is considered gone so now I will concentrate on hand work for a week to get over the stress I gave myself on that one! AND I never give up but on this one I have! Good to hear from you and thx for the comment. 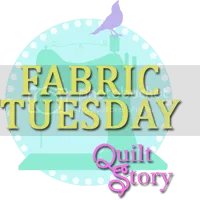 Lovely applique AND hexie projects to enjoy today! What pretty projects. I really like your Christmas quilt. Those hearts are very pretty. I am quite impressed with your timeline for finishing that applique quilt. That block is wonderful. 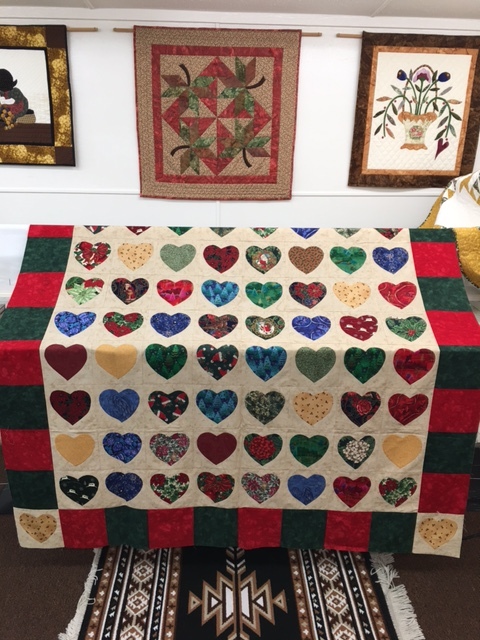 Thank you Cathie it will be fun quilting it – finally! 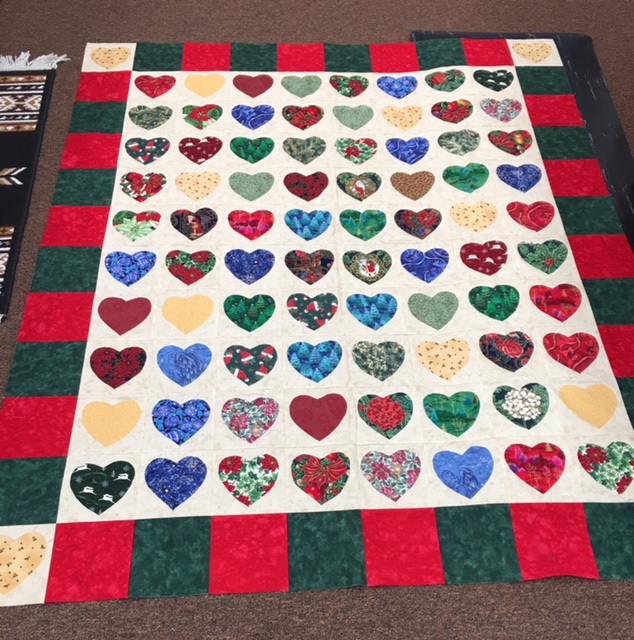 I do hope to finish the quilt for the SA show in September. Have a great day and thx for commenting. Your Nesting appliqué is as precise on back as on the front. I love the flowers in Brinton Hall, that Asian so typical of the 1890’s. I pray your hands stay supple and trouble free. Thank you. 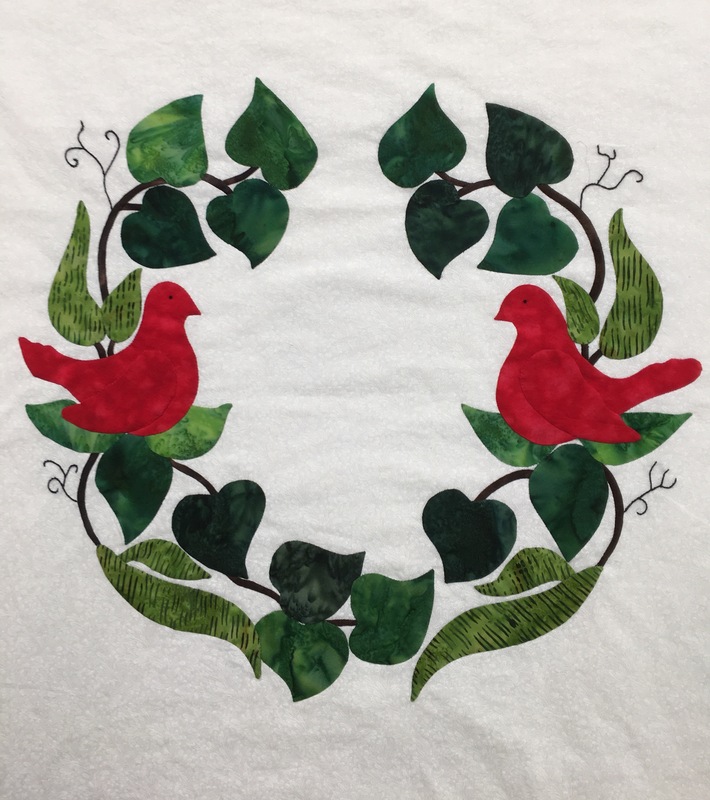 I love to applique, but those darn hands! When I started Brinton Hall, I looked at my stash of Asian fabrics and thought – it is time to use them! Have a great day! They are all beautiful. Your applique work is exceptional. The block with the birds is so pretty – I think it’s the bit of curl on the leaves that makes it. 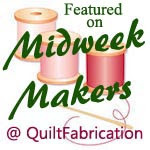 Thanks for sharing on Midweek Makers! Very nice projects you have going. Very nice progress too. Congrats. Thank you very much, I had so much planned this month and it is looking slim to none! Ever have a month like that – called Unforeseen Requirements!